To celebrate the 50th anniversary of Toyota's legendary 2000GT model, we're looking back at its iconic history as the original must-have sports car. Toyota has made some of the most iconic cars of all time, none more so than the stunning Toyota 2000GT that featured in the 1960s James Bond adventure, You Only Live Twice, starring Sean Connery as 007. Now celebrating its 50th anniversary this year – it’s no surprise that the 2000GT is Daniel Craig’s favourite Bond car. The timeless lines and long bonnet of the 2000GT are reminiscent of other iconic cars of the time and today it looks as fresh and as young as it did when it was launched. One 2000GT even made $825,000 at auction last year. When it was launched at the Tokyo Motor Show in 1967, it became the talk of the town. Toyota painted it metallic gold and hired the world famous supermodel, Twiggy, to stand on stage alongside it, leaving an indelible impression on the world. Lucky Twiggy, they even gave the car to her to say thanks for her assistance. Since its 1960s heyday, the 2000GT has featured in dozens of films and tv shows, it’s been owned and sold several times and has been sensationally restored and refurbished back to its prime before finally being returned to Toyota. As a sign of its iconic status, it now resides in the fabulous Toyota USA Automobile Museum in Torrance, California. One lucky owner of a 2000GT is Jane Weitzmann, who shares the story of her treasured 2000GT in a new video that’s helping Toyota mark the model’s first 50 years. 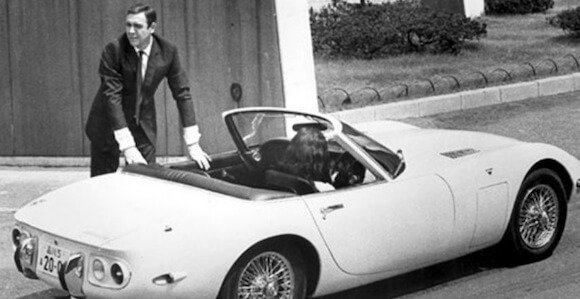 Jane wanted to own a 2000GT since she saw it in the Bond film and sourced a car from Japan nine years ago. It’s also been restored to its original condition and takes pride of place in a classic car collection that also includes its ’60s sports car sister, the Toyota Sports 800. Today, the equally stunning GT86 evokes memories of the glorious 2000GT and Celica GT-Four rally cars. The curves on the latest GT86 closely resemble the flowing lines of the classic 2000GT where form follows function. The GT86’s smooth lines are honed from a need to cut cleanly through the air but also look breathtaking too – just like the original 2000GT! Art can come in any shape or form but a car must conform to the laws of physics - and the Toyota GT86 is just such a car. History of Toyota sports cars Since the 1960s, Toyota has surprised and delighted people with its interpretation of what makes an engaging, exciting and entertaining sports car. Many of these have gone on to earn iconic status. We celebrate a selection of these landmark Toyotas sports cars here. 2000GT - History of Toyota sports cars Famous for its starring role alongside Sean Connery in the 1967 James Bond film You Only Live Twice, the Toyota 2000GT arrived on the world stage in the same year and instantly made a statement that Toyota was serious about challenging the best sports cars Europe had to offer. CELICA - History of Toyota sports cars With a name that means ‘Celestial’ or ‘Heavenly’ in Spanish, the minute the Celica turned a wheel in 1970, it was destined to be a star. The Celica was designed to provide drivers with a greater feeling of freedom, combining a practical interior within a sporty and affordable package. COROLLA - History of Toyota sports cars On the face of it, Toyota’s most well-known family car – and the world’s best-selling vehicle – the Corolla, would seem out of place in the company of highly-focused sports cars but, in truth, over the years the Corolla has produced some of the most well-loved sporting Toyotas. GT86 - History of Toyota sports cars For sports car fans and Toyota purists, the arrival of the GT86 in 2011 was a welcome relief. With no MR2, Celica or Supra in the range to satisfy their cravings for the past few years, the pedigree of the GT86 was exactly what they had been waiting so long for. MR2 - History of Toyota sports cars The MR2 of 1984 was actually derived from a 1976 design project that had the goal of building an enjoyable, yet fuel efficient car. Over the coming years, the ethos of the original concept evolved into a sports car and the resulting ‘Midship Runabout 2-seater’ was born. SUPRA - History of Toyota sports cars Supra, the Latin word for ‘transcending’ or ‘above’, would prove to be a particularly fitting moniker for arguably Toyota’s most famous sports car. Visions of the future - History of Toyota sports cars Shown at the 2014 Detroit Motor Show, the stunning Toyota FT-1 concept represents the ultimate expression of Toyota design by building on our sports car heritage to create a vision of what the future may hold.